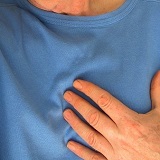 Reduce your risk of dying from heart disease. LDL cholesterol is the vehicle by which cholesterol is deposited into your arteries, leading to atherosclerosis (cholesterol deposits). When you have high levels of cholesterol in your arteries, you block blood flow through them. If you have atherosclerosis in your coronary artery (the artery providing oxygenated blood to your heart), you risk blood flow to your heart being compromised and you may have a heart attack. Studies show that by eating healthily and reducing LDL cholesterol levels, you can actually reverse atherosclerosis and therefore reverse heart disease! Know the optimal LDL cholesterol levels. The optimal LDL cholesterol level is between 50 and 70 mg/dL. If you keep your LDL cholesterol level under 70 mg/dL, you will drastically reduce your chances of having a heart attack. Reduce your LDL cholesterol levels. You can do this by reducing your intake of trans fat (found in processed foods, meat, and dairy), saturated fat (found in animal products and junk food), and dietary cholesterol (found in animal-derived foods such as eggs). Diets that are composed primarily of plant foods such as fruits, vegetables, whole grains, and beans have been proven to reduce heart disease symptoms and even reverse heart disease entirely! This should only be done by those who are at high risk of heart disease and are unable to bring down their cholesterol levels naturally with dietary changes. However, do take note that the side effects of statins could result in muscle or liver damage.